Torie peeking out from his hide! I have made him an awesome enclosure inside, and since day one likes to sleep in my hand. I hold him as you would hold an ice cream cone, his cute little face exposed out, my fingers wrap around his shell. I used to be able to get my fingers all the way around him, now that he is growing, no chance! He is so relaxed just sleeping there, I will kiss his little face every couple of seconds and he just keeps his eyes closed and waits for the next kiss. When I stop kissing him, he will gently (with his eyes still closed) reach his head out towards me to kiss him again! It is the sweetest thing I have ever seen! I wish I could get this on video for the world to see, but with me holding him in one hand, I cannot position even my phone to record his little face, eyes closed, reaching towards my face to be kissed again! It melts everyone's hearts that has seen him do this with me in person, and I get so many comments about how strange it is that he responds to me so well. I have quite a few tenants that just until these past few months, I have found out have had their own tortoises for years, are completely impressed how responsive and comfortable the little one is with me! That makes me smile everyday! Comments for My little Desert Tortoise! 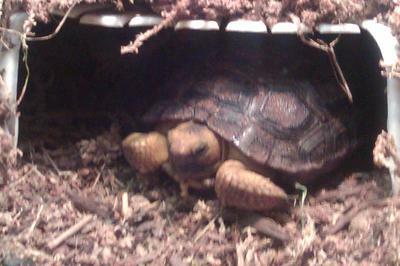 I found my baby tort who looks just like yours in my garage. His or her name is nugget. Nugget stays inside in his indoor house most of the time. 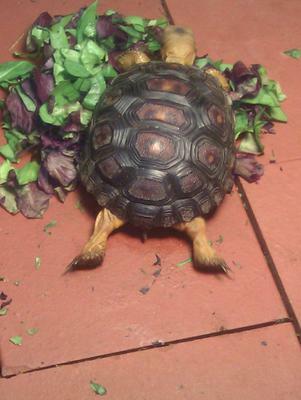 I just love this little tort. loves his head being rubbed. Only thing he is a picky pooper. Only goes in his outdoor house. ugh. Just love them. I have had Nugget for a year and a hafe. I'm so happy to see you here! It sounds like you found a very good human who will take very good care of you. I hope you will come back and post other stories about your life and adventures. It's great to see another tortoise lover here! I can tell you love yours very much. May you have many happy years together.